The tradition of quilting by the AHSGR Lincoln Quilters goes back to 1974 when Margaret Roh, mother of Mary Froscheiser and grandmother of Judy Runion, made a quilt top to be raffled at the November Broda in order to raise money for the June 1975 National Convention. 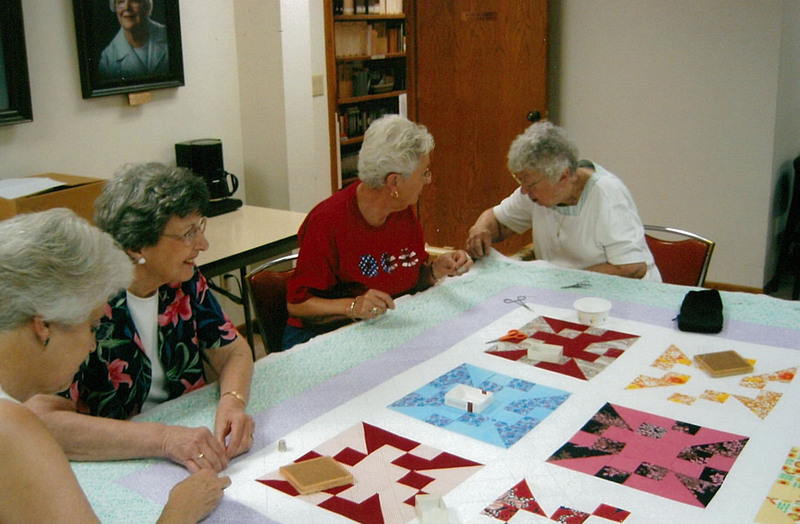 The quilters represent one of the oldest volunteer groups that work for the benefit of AHSGR. Through the many hours of work dedicated to the society, thousands of dollars have been raised and given for the national headquarters building operation. A special quilt is still made every year to be raffled at the Lincoln Chapter's annual Broda dinner in November. In 2007, the raffle raised $693. That same year the Lincoln Chapter Board of Directors wanted to honor these ladies for the thousands of dollars they have raised for AHSGR. The Board of Directors added an additional $307 so that a donation of $1000 was made to the new International Quilt Study Center being built at that time in Lincoln. This donation is recognized on the "Wall of Honor" at the Center. It lets all who visit the Center know that the Lincoln Chapter quilters have contributed much to the art of quilting. The quilters originally met in various individual's homes and in the H.J. Amen home. After completion of the headquarters building, the quilters met in the lower level three times per week, quilting form 8:30 AM to 3:30 PM. The women would take a coffee break and brought their own sack lunches. 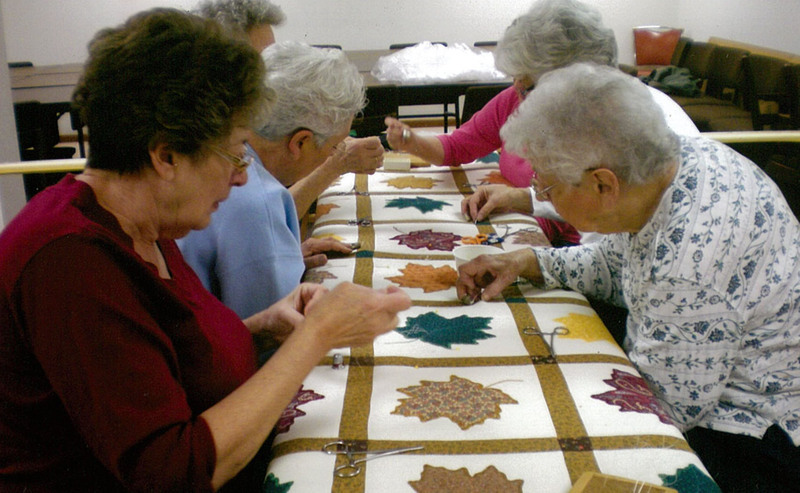 Today, the quilters meet once a week on Monday mornings from 9:00 AM to around noon. 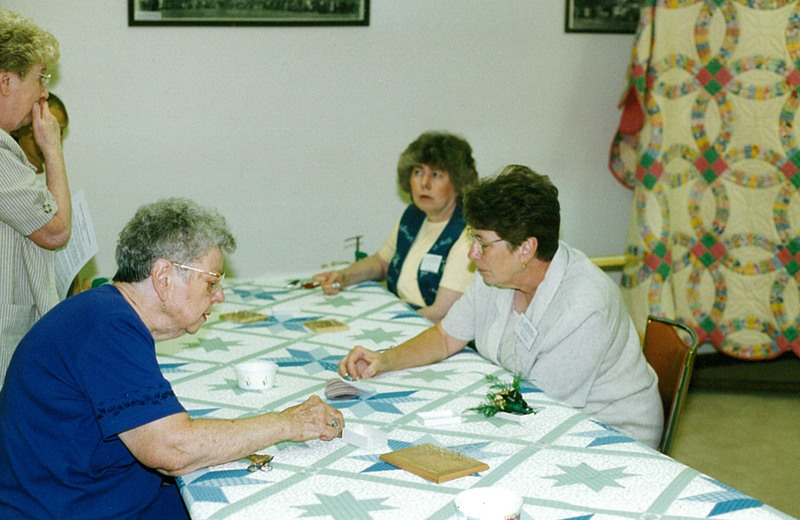 They still take a coffee break and enjoy discussing various quilt patterns, new procedures/techniques in quilting, and the camaraderie of the group. The quilters were mentioned in the Spring 2014 issue of Living Well, issued by Aging Partners in Lincoln. If you have a quilt top that you would like to have quilted, or are interested in joining the group (you do not need to be a member of AHSGR), please contact us. More pictures of quilts can be seen in the Photos of Events.